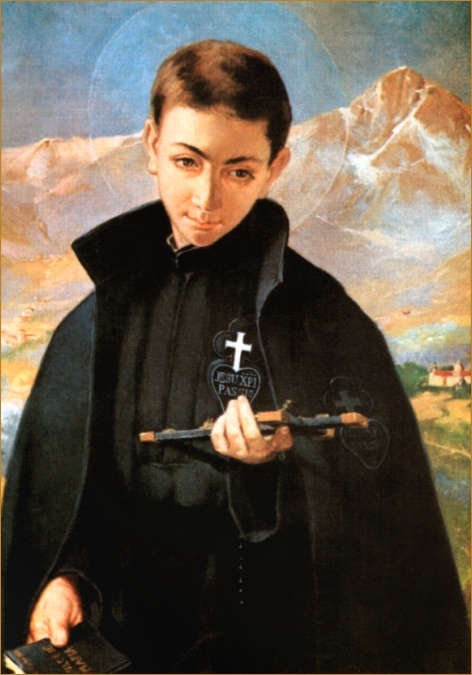 February 27, marks the feast day of Saint Gabriel of Our Lady of Sorrows (1838-1862), the patron saint of young people, students, and young religious. Saint Gabriel’s short life is marked by piety, faith, and obedience to the Lord, and religious vocation at the behest of Our Blessed Mother. While the last six years of his life, spent as a brother in the Passionist Order, were marked by humility, self-denial, and simplicity, Gabriel’s early life was quite the opposite. His complete consecration of his life to the Lord, despite the temptations of the modern world which he so loved, make his sacrifice a vivid example of the Christian love and obedience we should strive for. Born Francis Possenti, in Assisi, Italy in 1838, Saint Gabriel was the eleventh of thirteen children produced by the union of his parents. His father, a pious man with great political recognition in the area, and his mother, a well-connected religious woman from a respected family, were delighted in their son. He was baptized at the same font that his saintly namesake had been baptized nearly 600 years earlier. From an early age, Francis demonstrated the potential for thoughtfulness and piety. He encouraged his teacher and siblings to pay more attention to the poor, oftentimes choosing to give some of his portions to those in need. Before he reached the age of four, his mother passed away from a serious illness, as did four of his siblings. Francis, the most sensitive of the family, was severely moved by these losses, increasing his empathy for others and his sensitivity to those in need. As Francis matured, he developed insight into the fact that he was smart, charming, and attractive. He pursued hedonistic pleasures like art and theater, which he would later write to friends almost “cost him his soul.” He dressed to perfection, paying careful attention to his appearance. Francis excelled at school, and was generally the award-winner in all of his classes. He was chosen to give his commencement address upon graduation from the Jesuit College. Francis embraced the world, and to his classmates and friends, he appeared to have all the tools required for great success. He was the center of attention wherever he went, all the doors of the finest families and establishments open to him throughout the city. And while he was impulsive, prone to anger, and pridefully vain, he was poised to achieve great worldly things. But Francis felt called in a different direction. Twice, Francis came down with serious illnesses while in school, illnesses he was not expected to recover from. During these times, he prayed to the Lord, promising to become a religious if his life was spared. While a student at the Jesuit College, he had asked permission to enter the Order, and was granted permission from his spiritual director. But Francis delayed entering the Order, finding reasons to wait. He maintained his faith, praying daily in the chapel and receiving the Eucharist, but could not commit to the religious life and give up his worldly enjoyments. As time went on, Francis began to doubt his choice of the Jesuit Order, instead feeling called to become a Passionist, the Order formed by Saint John of the Cross. His spiritual director encouraged him to wait and pray, and see where the Lord led him. From that moment, Francis’ life changed. He entered the noviatiate of the Passionists, where he would live until his death. The Passionist Order is a strict order, and his family and friends urged him not to commit to such a life. Rather, they suggested he become a priest, or better yet, not become a religious and use his “talents” in the world. Francis was not to be disuaded. After his initial retreat, he was clothed in the robes of the Passionists, and gave up his name for a new name: Gabriel of Our Lady of Sorrows. Many from the Order watched and prayed in his cell with him, as they knew his moment of death was close at hand. They were moved to tears by his devotion, and by the love with which he implored the comfort of Jesus, Mary, and Joseph. By their records, Gabriel suddenly turned his eyes to the left and above him, gazing in rapture upon some heavenly vision. With a peaceful smile, he died, never letting go of his beloved picture. Not yest a priest when he died at age 24, Gabriel was buried at the Passionist retreat in Isola di Gran Sasso, Italy. When she was approximately 20, and on her deathbed, Gemma began her novena to Saint Gabriel. While trying to sleep, she heard the rattling of a Rosary and he appeared to her, saying, “Do you wish to recover? Pray with faith every evening to the Sacred Heart of Jesus. I will come to you until the Novena is ended, and will pray together to this Most Sacred Heart.” On the last night of the Novena, Gemma was miraculously cured of all her ailments, a scientific impossibility at the time. Saint Gemma went on to be visited by the Blessed Virgin Mary, and bore the stigmata throughout her prayerful life, committed to Jesus.